A dark paint color can change the complexity of a room! Do you have a painting project on the horizon? If you want to design a space that uses dark paint, it’s great to have some direction and focus. Check out these tips for the most dynamic ways to use dark colors. The first tip for using dark colors with which to paint is choosing the right room. As the tones you choose have a great impact on the vibe of the space, choose a room where you want the atmosphere to reflect a feeling of warmth, comfort, or even peace. 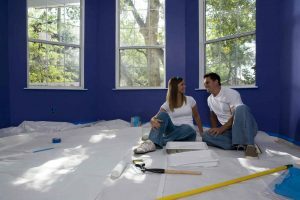 Since this is the case, many people choose to use dark paint colors in spaces including the bedroom, bathroom, basement bar, or other entertainment space. Lighter or white trim is a great way to enhance the beauty and richness of dark tones. Use white on the wainscoting, door frames, and on the ceiling. It not only helps keep the room from feeling too dark, but it also highlights the beauty of the tone in color and adds intrigue to the overall design of the room. Use one wall in the room as your art gallery. Paint this wall with a dark color so that the art stands out on the deep background. On a white wall, the various colors in your art may not stand out as well as they do against a dark background. Another great tip is to use white frames for photos for an extra touch of elegance. Choose a lighting design that allows you to spread the light around the room rather than just using one fixture. In addition to light from the ceiling, also incorporate lamps to prevent your room from feeling too dark.